Ron and Karen Hood take you and 12 folks into Idaho?s River-of-no-Return Wilderness for 8 days. What you will see is a graphic record of their experience. This video is a cross between ?Jeremiah Johnson? and ?Blazing Saddles?. It is both enormously funny and incredibly instructional. 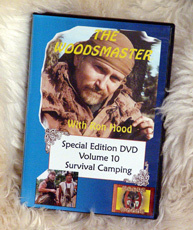 You will see how to tell time by the North Star, build a wilderness sauna and make a primitive forge. See how to make and use Bannock, wilderness drills, body-bag hammocks, how to make use of rotting carcasses and how to fashion a fishing pole. You will learn how to prepare rawhide and tendons and trap game. There is so much in this video that it is impossible to explain it all. You will also learn how to prepare your pack for that time you want to test Your skills! Caution: There are a few sections in this video that can be unsettling to sensitive viewers. You have seen worse on regular TV however. Do not drink liquids during the donut making sequence!